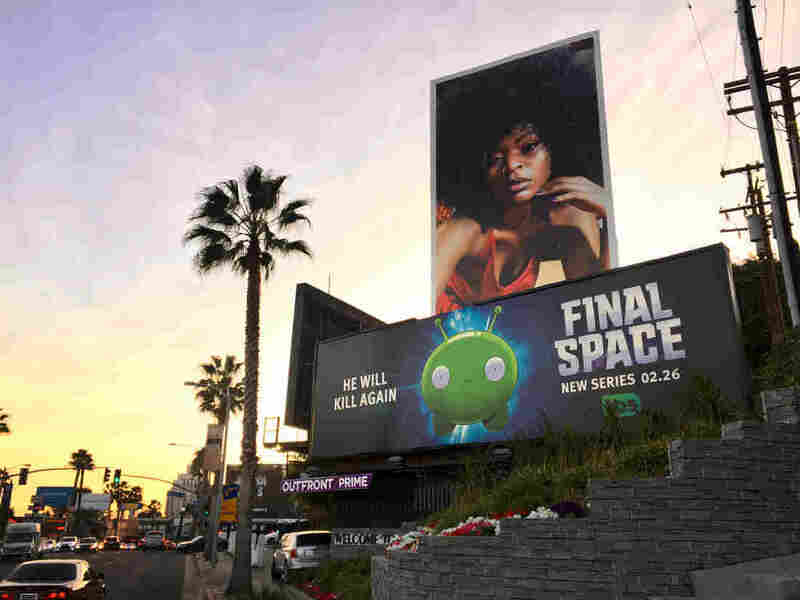 On LA's Sunset Strip, A New Golden Age Of Billboards Traditional advertising is on the decline, but billboards targeting Hollywood's elite are shining. Tech and entertainment companies have boosted spending to keep their brands in conspicuous places. Ads for tech companies like Apple and Netflix dominate billboards on Sunset Boulevard in Los Angeles. In one sign of how hot billboards are, Netflix, the television and tech giant, reportedly is offering to buy a billboard company for $300 million. Hollywood and tech companies love the old-fashioned billboard. Look no further than the Sunset Strip, a mile of Sunset Boulevard between LA and Beverly Hills in the city of West Hollywood. Famous for decades for its nightlife, it's one of Los Angeles' most popular attractions. Places like the Whiskey a Go Go, the Rainbow Bar and Grill, and the Viper Room are part of what give the Strip its allure. The nightlife and the proximity to the homes of the stars help make the Strip the most expensive area for billboards outside of New York's Times Square, says Brian Alexander with Billboard Connection, a billboard advertising agency. There are no billboards in nearby Beverly Hills where many of the stars live, but West Hollywood takes pride in its billboards. As we walk down the Strip, Alexander notes that the advertisers there are mainly tech, entertainment and fashion brands. A full-size billboard on the Sunset Strip costs $35,000 to $100,000 and beyond per month, he says. The Strip is commonly advertisers' first choice to locate their billboards, but when Alexander tells them the price, he often has to readjust their expectations. He says he tells them, "We got something for you maybe on Fairfax or 3rd Street, Beverly, all fine streets by the way, with plenty of traffic. But yes, it's not the Sunset Strip." Sure, billboards seem old-fashioned in the digital age, but that's their selling point, Alexander says. "Billboards cannot be turned off, deleted, thrown out, have [their] channel changed and so they're in your face," he says. Advertisers like billboards because they provide context for an ad based on location, says Nancy Fletcher, president of the Outdoor Advertising Association of America. "If you are a movie, you could target a studio. If you're a star, you can actually put it on the way, if you know which way they drive home," she says. A billboard advertising Marlboro cigarettes overlooks Sunset Boulevard in in the Beverly Hills section of Los Angeles in 1994. Tech is one of the top sectors advertising on billboards. Nationally, Apple is the No. 2 billboard advertiser, after McDonald's. And Netflix has at least eight billboards on the Strip. One of the most famous and expensive billboards in Los Angeles is located near the Chateau Marmont Hotel. Alexander says it easily costs over $60,000 per month and Apple has a long-term contract. 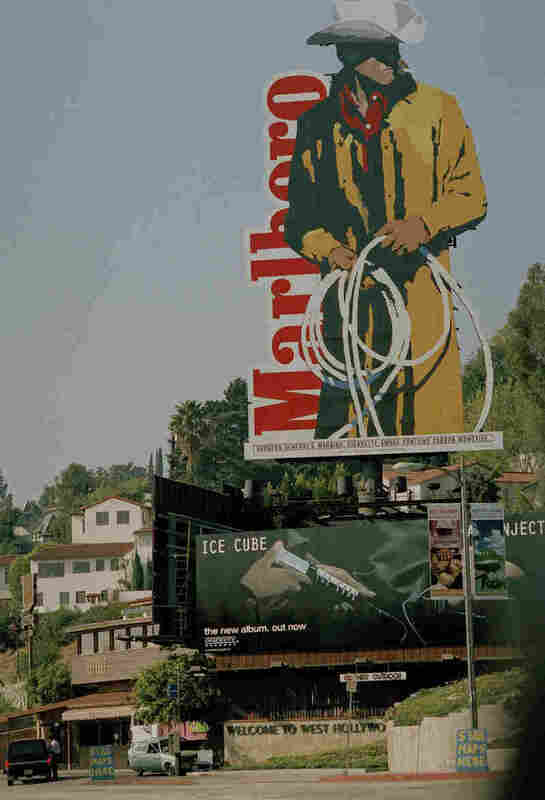 It was once a billboard for the Marlboro Man. "It has a great view as you approach it. It's obviously larger than life, you cannot ignore that," Alexander says. As tourists and celebrities travel the Strip, "there's nothing you can do except see that huge billboard as you go around this turn," he says. When he started, Alexander says, his friends chided him for being in such an old-fashioned business. Now, he says, tech is making a new golden age of the billboard.